Kristjan-Paul Raude is the CEO and strategist at WSI Online/WWW Marketing OÜ. The audience consisted of students, marketing and sales specialists from different businesses and entrepreneurs. Raude gave tips about digital marketing and illustrated them with practical examples. In the second part of the seminar, Raude asked the audience to form groups and think of a persona (a concrete representative of the target audience) for a business. The groups presented their personas and that brought out points that businesses need to think about while marketing for their target audience, like the visibility and uniqueness of the business. 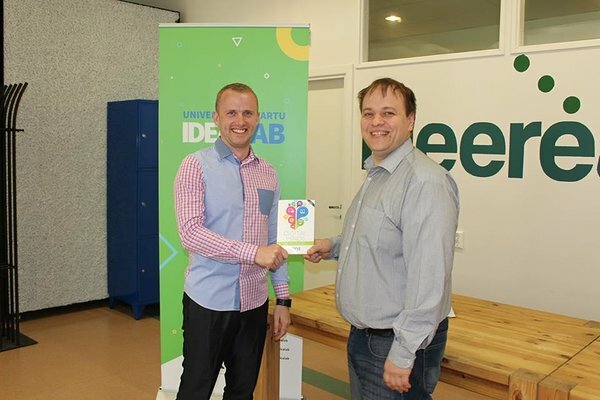 Kristjan-Paul Raude gave Tartu University faculty of Economics five copies of "Digital Minds", a handbook on digital marketing written by 12 consultants from the WSI marketing agency. WSI marketing agency was founded in 1995 and is currently active in 80 countries with close to a 100 consultants. The head of WSI marketing agency in Estonia since 2008 is Kristjan-Paul Raude himself. If anyone is interested in this book, all you need to do is step by UT Idea Lab. The next workshop, Pitching training, will take place on May 12th at UT Idea Lab and it will be moderated by Gleb Maltsev, co-founder at Fundwise.me and annual trainer for Ajujaht finalists. It pitching is something you are interested in or you feel you could learn a thing or two about this topic, head out to Gleb Maltsev's twitter.